A photo accompanying this release is available at http://media.globenewswire.com/noc/mediagallery.html?pkgid=18584. Reviewed GSC’s level one requirements and synthesized a set of study ground rules and assumptions emphasizing automated operations, simplicity and low cost. The study determined that for GSC’s mission architecture, there are many more options for all cryogenic propellants compared with storable propellants, but that multiple storable propellant options are possible. Cryogenic propellants have higher performance, but are more difficult to contain for the GSC mission duration than storable propellants such as those used in the Apollo program. Three-dimensional solid models with representative crew members established target pressurized volumes for the ascent pod and surface habitat. This unique approach has a good chance of meeting GSC’s objectives with all-storable propellants, which reduces development risks and costs. Northrop Grumman and its legacy companies – Grumman Aerospace and TRW — designed and built the Apollo Lunar Module and Lunar Module Descent Engines. 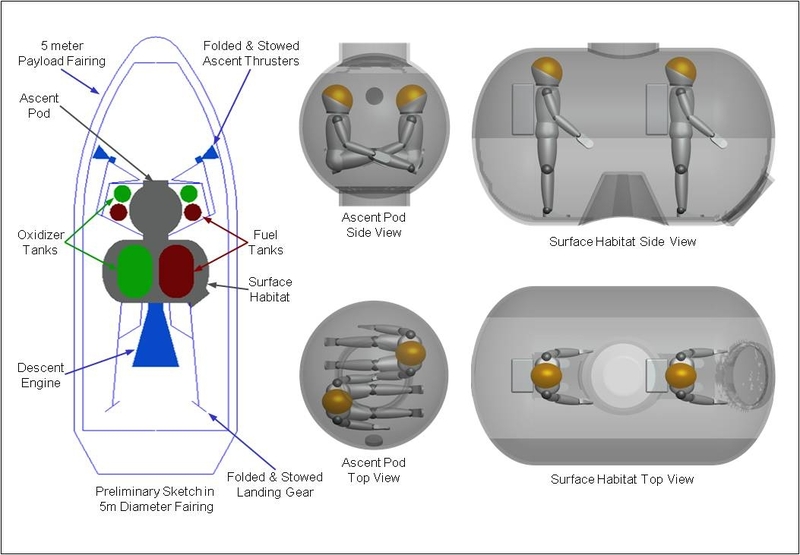 2 Comments on "Northrop Grumman Presents Lunar Lander Concept for Golden Spike"
With the caveat that, something is better than nothing, I can’t help but feel unexcited by this design. The 5 metre fairing points to Delta, Atlas or Falcon Heavy, but surely only the FH would be economic, not to mention far superior lift. Given that two FH launches could put 30-35 tonnes into lunar orbit, it would have been nice to have seen a more ambitious lander concept. Perhaps a surface mission of several days, rather than the few hours hinted at by this design proposal. Given that two FH launches and a Dragon to cost around $300million, then with a mission price of $1.5billion, this lander design looks a little mean. I am of course, being ultra critical, especially given the miserable lack of progress in human space flight for the last 40 years and each Shuttle mission (just to LEO) averaging $1.46billion. Also, I do welcome anything that may just get the ball rolling. Yes Michael, They should switch to liquid rockets to begin with so they don`t have to rebuild their rockets after every flight and they should build their own reusable first stage that is capable of returning to base after each flight that would make them really competitive with other companies like SpaceX. It is fine to start the way they have but there should be plans to improve their system and bring down costs into the future.